The Jaybird Run True Wireless Sport headphones are a solid true wireless solution for runners, gym-goers and your average wire-hating listener alike. With a reasonable price point, nice design and plenty of neat app-enabled features it's easy to forgive them for some of their shortcomings. Jaybird is an audio company that’s rapidly establishing itself as a favorite among athletes as well as those simply looking for a good wireless listening experience. With its new Run earbuds, Jaybird is now stepping into the new and increasingly competitive true wireless category. With everyone vying to be the ultimate Apple AirPod alternative, truly wireless earbuds have improved a lot since their early days both in terms of performance and cost and Jaybird wants to be the first pick for athletes. So, is that likely? Yes. With its Run earbuds, Jaybird has created a pair of solid true wireless earbuds that will suit runners and casual listeners alike. And at £169.99/AU$249.95 they fall into the affordable bracket (albeit the higher end of it) when compared to the competition. As far as design is concerned, the Jaybird Run earbuds are simple, reasonably stylish and not overly large which can sometimes be the case with true wireless headphones. Unlike over ear headphones, which often become something of a fashion statement, true wireless headphones should be inconspicuous. As a result you’ll only get two color options here – white and black. Though they do have a nice literal silver lining with their matte silver accents on the outer part of the earpiece and a silver Jaybird logo in the center. They also come with a matching matte black capsule shaped charging case which feels satisfyingly weighty and fits neatly into the palm of your hand. The size and weight of the case make it perfect for slipping into your pocket and carrying around just in case your earbuds need a battery boost in the middle of the day. Removing your earbuds from the case will automatically turn them on and allow you to connect immediately to your phone while they’ll turn off after 30 minutes of non-use when left outside the case to conserve battery. There's also a manual pairing mode that you activate by holding the button on the right earbud for six seconds. The case also has a handy series of lights on its front – a light on its main button will glow red when the case itself is low on battery, while small lights flanking it will glow green when there’s an earbud docked for charge but remain blank if there isn’t. This is a good way to quickly clarify that you’ve placed your earbuds inside the case correctly to them to charge. The headphones themselves come with a multitude of fins and tips (three of each to be exact) to help you get the best fit possible. Though pouring all the pieces out of the bag they’re stored in can look overwhelming and feel like the start of a tedious process of trial and error, it’s good that Jaybird provide this level of customization – having the most exact comfortable fit possible is exceptionally important with true wireless. After all, who wants their earbud to jump from their ear mid-run and roll into the abyss? Plus, unless your ears have similar qualities to Pinocchio's nose, you shouldn’t have to change them again. When we got the right combination, we found the Run earbuds to be very comfortable with good sound isolation and the fin-tips were surprisingly adept at keeping them secure. The sound isolation was so good, actually, we were glad to see these earbuds have been designed for one-ear use. Though it's wonderful to know the terrible music your gym plays won't leak through here, those who run outside will want to be more aware of their surroundings. With their sweat and water resistant hydrophobic coating, lightweight build and adaptable fit these earbuds are more than up to the task of joining you (and staying with you) on a high energy run. Despite being physically secure, the Jaybird Run earbuds do sometimes suffer from an inconsistent Bluetooth connection. Oddly this seemed to occur most when we placed our phone in our back left trouser pocket, a problem which certainly isn’t exclusive to these particular true wireless earbuds. We don’t think we have particularly giraffe-like necks but this is a problem that’ll be easily solved by putting your phone in a sports armband while you run. Interestingly, we found we were able to put our phone in a simple tote bag which took the phone around the same distance from the earbuds as our back pocket without the connection faltering. We’re not sure what it is about this position in particular, then, that seems to impact the connection so badly but if you can avoid it you should find these earbuds offer an otherwise solid connection, especially between the buds themselves. You’re not going to get the highest quality listening experience on the market from these headphones but that’s not why most people purchase truly wireless earbuds, particularly a brand that angles itself so heavily towards runners. The box for these headphones depicts several professional athletes using them rather than professional musicians for a reason. Here, you’ll find clean, clear and bright sound quality that packs a decent level of bass. The sound is, however, given an extra boost by the free Jaybird companion app which allows you to customize the sound signature across low, mid and high frequencies as you listen to songs. Considering the sound of Jaybird Run doesn’t heavily lean any particular way and can sometimes come across rather flat, this app is a great additional feature that allows you to create a slightly more personalized listening experience. However, the customisation that's offered doesn't overcome the fact that the level of sound detail offered by these headphones isn't exceptional. Conveniently, the sound profiles you create are saved to your headphones rather than the device you use to listen to music so you only have to set your preferences once to use them across any of your devices. There are presets here but we recommend creating your own. The app also has a Find My Buds feature which is particularly helpful. Wires have a lot of downsides but to their credit they make it harder to lose your headphones. To foster a sense of community, Jaybird has made it possible to share Spotify playlists through the Jaybird app, too. This means if you have a particularly great running playlist on Spotify or you’re looking for something a little different, you can enter this section in the app, select a playlist and it’ll automatically open up in Spotify and start playing through your earbuds. For those who don’t have the time or inclination to cultivate the perfect playlist, this is a great way to change up your listening habits. As well as listening to music, you can also take calls using the Jaybird Run earbuds. When a call comes in your music will stop and you’ll be able to simply tap a button in the center of the right earbud to pick up, while a second tap will end the call. When it comes to sound quality, we found we had no problems hearing the person on the other side of the call, but they had slightly more trouble hearing us. Our tester caller said our voice sounded somewhat muffled and because of the inconsistent Bluetooth connection that arose from our phone’s position in our back pocket sections of sentences were sometimes lost. That said, we were still able to hold a lengthy phonecall while walking outside with these headphones and found it to be extremely convenient. That’s not the only voice you’ll hear in your ear with these earbuds, either – the Jaybird Run also support Google Assistant and Siri. Simply tapping the left earbud’s centre button will start up whichever assistant your phone supports and you can simply state your request. This is exceptionally convenient and a feature we’re seeing come to true wireless earbuds more and more so it’s good that Jaybird is heading the curve here. So, if the earbuds’ central buttons can answer calls and start up a voice assistant, what else can they do? Unfortunately not quite enough to be completely convenient. Double pressing the right earbud also allows you to skip forward through tracks which is great if you come to a song that doesn’t suit your pace. However, there’s no option to skip backwards. We don’t know if this is part encouraging a runner’s ‘don’t look back, only move forward’ mentality, but it didn’t really suit us if we wanted to enjoy a song for a second time before moving on. You can actually change what the buttons do within the Jaybird companion app, but this is a choice between two preset control settings rather than full customization. Default controls are the aforementioned while an alternate control system can be selected that will allow you to press the left bud to lower the volume or the right bud to increase volume and take calls. It’s really convenient that you can do this but it does feel slightly limited. We couldn’t help but wonder if being slightly more creative with button press combinations (like the Beoplay E8 headphones) could have meant the earbuds would be capable of more hands-free functions. It would also have been nice to have a more customization button profile rather than two presets. Particularly as you’ll have to choose before you start running whether or not you want volume or track skipping controls if you want to avoid having to pull out your phone. The controls occasionally need to be pressed quite hard if you want them to work as well, which feels a little uncomfortable when the earbuds are already wedged in your ears. 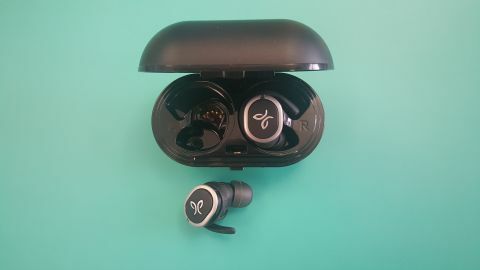 As far as battery life is concerned, the Jaybird Run earbuds will last for around 4 hours each which should get you through most listening sessions but if that’s not enough their charging case holds a further 8 hours of charge. This brings your total portable listening time up to a more than reasonable 12 hours and Jaybird boasts that popping the earbuds into their case for just 5 minutes will give you enough of a boost to listen for a further hour which is great if you left them out of the case before your morning run. When battery life drops below 30%, the earbuds will let you know via a voice alert. It’s also possible, however, to check the battery life at any time just by pulling out your phone where the battery life for each earbud will also appear on your home screen. Something annoyingly we noticed that the right earbud seemed to drain much faster than the left, presumably due to the fact that it's acting as a bridge between the phone and the left earbud. Though we were able to get around 4 hours out of each earbud, the right earbud would frequently be sitting around 15% below the left despite both being used for the same period of time. This irritated our sense of symmetry when pulling up the battery life on our phone if nothing else. Jaybird RUN True Wireless Sport Headphones will be available worldwide from October 2017 with pre-orders available on jaybirdsport.com where their suggested retail price is £169.99/ $179.99/ AU $249. The Jaybird Run earbuds are a well-designed, comfortable and affordable pair of true wireless earbuds that we’d be more than happy to make our running headphones. With 12 hours of total battery life and their convenient 5 minute boost charge function, they’ll make it through even the most rigorous fitness sessions. While their sound won’t blow you away, the Jaybird companion app is extremely useful for creating a more personal sound profile and discovering new music to listen to on your run. That said, it’s certainly worth pointing out the occasional connection drops between the headphones and our listening device. Though they weren’t frequent enough to be overly problematic, they do still occur. There’s also the limited functionality of the buttons on the earbuds themselves. Though admirable efforts have been made to make them multi-functional, we couldn’t help but feel more could have been done here, particularly as companies such as Marshall have managed to do more with a single directional knob on their wireless offerings. With the Run Wireless Sport earbuds, Jaybird has created a solid true wireless solution for runners at a reasonable price. Whether you’re an avid runner or simply detest being restricted by wires, we’d happily recommend these. If you’re an audio purist, however, you should probably steer clear. Comfort, style, battery life and a convenient companion app are particular highlights.